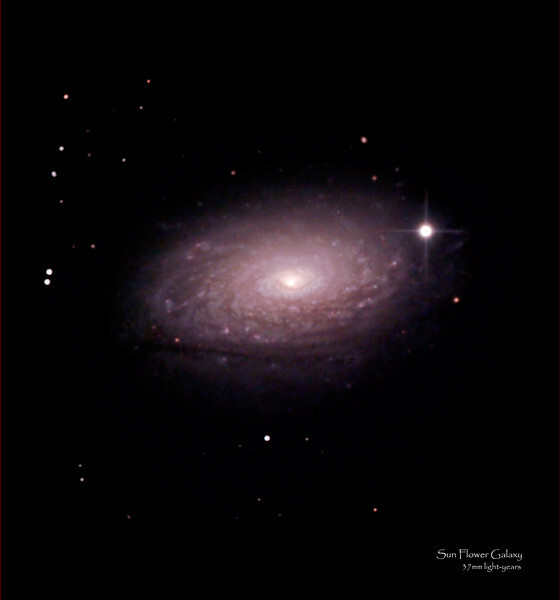 The Sunflower Galaxy (also known as Messier 63, M63, or NGC 5055) is a spiral galaxy approximately 37 million light years away in the constellation Canes Venatici. It consists of a central disc surrounded by many short spiral arm segments. The Sunflower Galaxy is part of the M51 Group, a group of galaxies that also includes the Whirlpool Galaxy (M51). It is one of the more interesting galaxies to photograph, given its detail and relative magnitude (9.3).